There are very few movie franchises as iconic as the Star Wars Saga, with pretty much all of them (even the prequels!) being a rich source of classic movie lines. 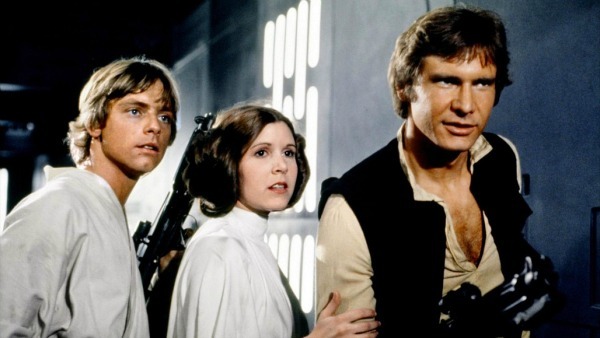 We love the franchise so much we just wanted get into the hype of it all and share our list of the best quotes from the Star Wars movies. Note that we will continue to add to our list as and when a new Star Wars movie is released. We all wanted to love this movie after waiting for so long for it to be released, but sadly this film just lacked in every way a movie could. The plot is mostly exposition and the characters are all wooden, but on the positive side it had a great score and some impressive action sequences. Even though most of the dialogue was cringe-worthy we managed to find a few golden nuggets in there. Qui-Gon Jinn: Always remember, your focus determines your reality. Yoda: Everything. Fear is the path to the dark side. Fear leads to anger. Anger leads to hate. Hate leads to suffering. I sense much fear in you. Anakin: Mom, you said that the biggest problem in the universe is no one helps each other. Shmi Skywalker: You can’t stop change any more than you can stop the suns from setting. 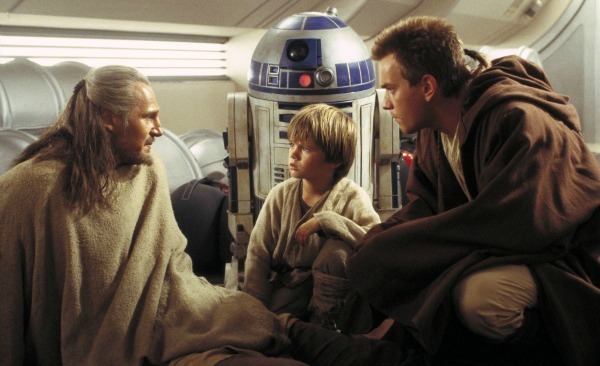 Qui-Gon Jinn: Greed can be a very powerful ally. Yoda: May the force be with you. The second sequel in the prequel movies suffers pretty much from the same faults as the first movie. The script is still very weak and the characters are one dimensional and underdeveloped, but with all of that it manages to slightly improve on the underwhelming first prequel movie. 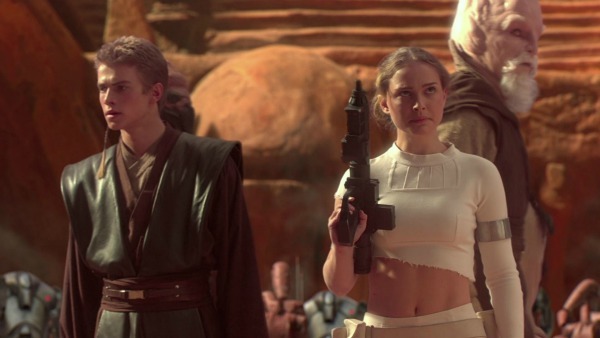 Padme: To be angry is to be human. Anakin: I’m a Jedi. I can be better than this. Obi-Wan: Be mindful of your thoughts Anakin. They’ll betray you. Anakin: Attachment is forbidden. Possession is forbidden. Compassion, which I would define as unconditional love, is essential to a Jedi’s life. So you might say, that we are encouraged to love. Anakin: When I got to them we got into aggressive negotiations. Anakin: Ah, well, it’s negotiations with a lightsaber. Yoda: Truly wonderful, the mind of a child is. While this movie still never lived up to the original trilogy standards it was a massive improvement on the first two prequel movies. The characters are fleshed out more and the action sequences are more impressive but the movie still suffers from seriously bad dialogue and even though it closes some loose ends concerning the original trilogy the plot still feels inconsistent. And who can forget Vader’s farcical “Nooooo!” in his most emotional moment, which totally ruined that great scene. Anakin Skywalker: I won’t let these visions come true, Master Yoda. Yoda: Twisted by the Dark Side, young Skywalker has become. The boy you trained, gone he is consumed by Darth Vader. Obi-Wan: You were the chosen one! It was said that you would destroy the Sith, not join them. You were to bring balance to the force, not leave it in darkness. Obi-Wan: You were my brother, Anakin. I loved you. Count Dooku: I sense great fear in you, Skywalker. You have hate. You have anger. But you don’t use them. Supreme Chancellor: Remember back to your early teachings. All who gain power are afraid to lose it. Even the Jedi. 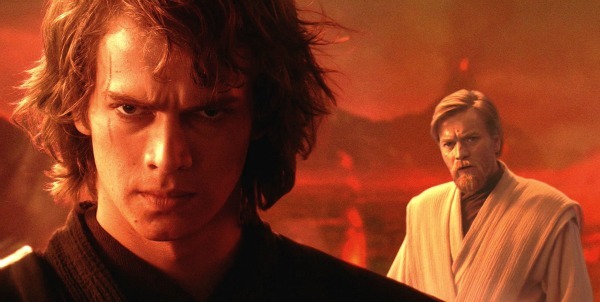 Anakin Skywalker: The Jedi are selfless, they only care about others. George Lucas’s introduction to this amazing space saga with such memorable characters which created a pop culture phenomenon that I don’t think has even been equaled in quite the same way. Obi-Wan Kenobi: In my experience, there’s no such thing as luck. Obi-Wan: Who’s the more foolish, the fool, or the fool who follows him? This second sequel in the original trilogy brought in the same ingredients as A New Hope but in a darker more sinister tone with a more involving plot and the ultimate classic twist that everyone loves so much! Luke Skywalker: I don’t…I don’t believe it. Yoda: You will be. You will be. Darth Vader: Search your feelings, you know it to be true. Although the final sequel in the original trilogy gets a little to get going and is not as mature as its predecessor it still ends in a rewarding and satisfying note. Luke Skywalker: Your thoughts betray you, Father. I feel the good in you, the conflict. Luke Skywalker: You couldn’t bring yourself to kill me before and I don’t believe you’ll destroy me now. 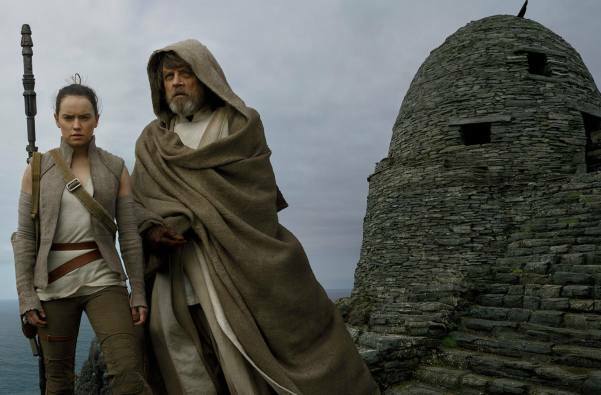 Luke Skywalker: Come with me. Leave everything behind. Darth Vader: Obi-Wan once thought as you do. You don’t know the power of the Dark Side. I must obey my master. Luke Skywalker: Because, there is good in him. I’ve felt it. He won’t turn me over to the Emperor. I can save him. I can turn him back to the good side. I have to try. Luke Skywalker: Then I am a Jedi. Darth Vader: Give yourself to the Dark Side. It is the only way you can save your friends. Yes, your thoughts betray you. Your feelings for them are strong. Especially for…sister. So, you have a twin sister. Your feelings have now betrayed her, too. Obi-Wan was wise to hide her from me. Now his failure is complete. If you will not turn to the Dark Side then perhaps she will. Luke Skywalker: But you’ll die. Darth Vader: Nothing can stop that now. Just for once let me look on you with my own eyes. Anakin: Now go, my son. Leave me. Anakin: You already have, Luke. You were right. You were right about me. Tell your sister you were right. Luke Skywalker: Father, I won’t leave you. The seventh movie in this epic space saga is a true return to form and feels like the original trilogy. Yes, it’s not a perfect movie and it does rehash some of the main plot points from the original trilogy but to us that’s didn’t take anything away from it. J. J. Abrams has managed to breathe new life into this franchise and make the fans feel excited again and create new fans at the same time! Finn: We’ll figure it out, we’ll use the Force! Han Solo: That’s not how the Force works! Han Solo: Women always figure out the truth. Always. Rian Johnson’s sequel of the ongoing saga, which seems to have set off a new wave of controversy since the prequels. Although the movie is probably the most visually stunning of the Star Wars movies, the story as whole does not follow suit. Love it or hate it, the movie does offer some great lines. Kylo Ren: Let the past die. Kill it, if you have to. That’s the only way to become what you were meant to be. Vice Admiral Holdo: When I served under Leia, she would say, hope is like the sun. If you only believe in it when you can see it, you’ll never make it through the night. The first of the standalone anthology movies, which is going to be probably best remembered for bringing back Peter Cushing and some of the best Darth Vadar moments in the Star Wars Saga. Chirrut Îmwe: The Force is with me. And I am with the Force. And I fear nothing. For all is as the Force wills it. 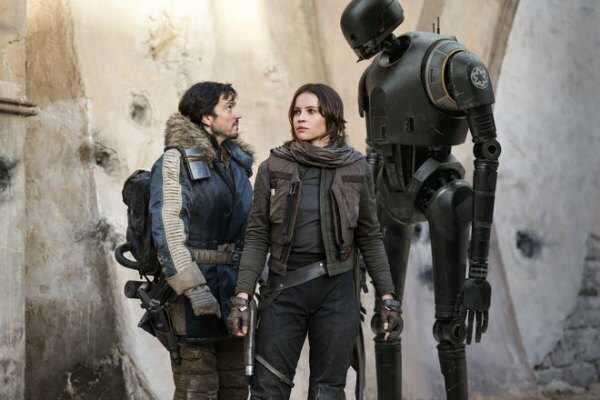 Cassian Andor: Rebellions are built on hope. 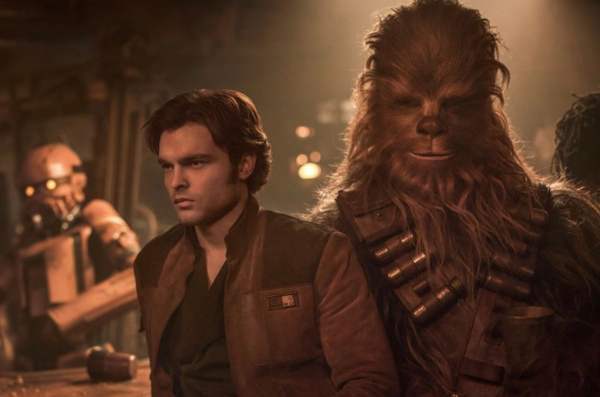 The second in the standalone movies giving us the backstory to one of the most iconic and popular characters in the Star Wars universe, Han Solo. Sadly, this is a movie that truly should not have been made, but here we are, and you can enjoy for what it is, an average fantasy action adventure. Lando Calrissian: I hate you. Tobias Beckett: [to Han] You want know how I’ve survived as long as I have? I trust no one. Assume everyone will betray you and you will never be disappointed. An impressive share! I have just forwarded this onto a colleague who had been conducting a little homework on this. And he in fact ordered me lunch simply because I stumbled upon it for him… lol. So allow me to reword this… Thanks for the meal!! But yeah, thanks for spending time to talk about this issue here on your web page.